But God’s not finished. He’s waiting around to be gracious to you. He’s gathering strength to show mercy to you. All good things come to him who waits originated with the French tracing back to the 1500's. While it seems that waiting has been an issue for generations it would appear that the origins of all good things come to him who waits has a much longer history than France. The inability to wait, and allow good things to come, can probably be traced back to our initial parents–Adam and Eve. Throughout any given day we are asked to wait, forced to wait or wait by default. Waiting seems to be an itch that becomes more irritated with our scratching. We just don’t want to wait for the medication to do its job. 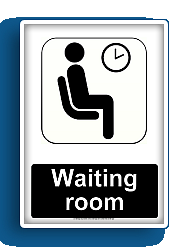 Isaiah’s definition of waiting isn’t particularly comforting, in fact, it promises a lengthy scenario! Not only is God waiting to be gracious to us, but he takes time to do everything right. Nothing can be hurried or impulsive when the promise of everything turning out right is at stake. It’s all there--graciousness, mercy and rightness–the healing balm for the waiting itch. What is required of us is to stop scratching, allowing time for the balm to do its good work. Creatures of habit find it difficult to change. But, in order to experience the right, gracious, mercy of our Father who isn’t finished with us, waiting is necessary. By remembering everything that was right from our past we rediscover our belief, the healing balm, that God is gathering strength for our waiting future. Thought for the Day: What are the "waiting" areas of my life?